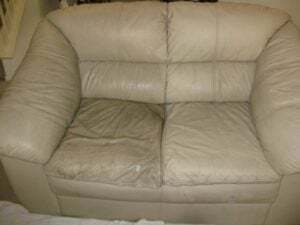 The right half of this couch has been cleaned, and the left half has not. Your leather couch is an expensive investment, and you need to treat it right if you want it to last. Think about it like preventative maintenance on your car. You change your oil to keep your car running smoothly. To keep your leather couch in good shape, you need to protect it and clean it regularly. Did you know that a leather couch will last 3 times as long if you clean and protect it regularly? We recommend that you clean and condition your whole couch twice a year. Clean the parts you use the most (the head and armrest of your favorite spot, for example) 3 to 4 times a year. Leather is very porous, so it soaks up the dirt and oils from our skin very easily. Even before you can see the effects of this damage, the leather is collecting the dirt and oil it soaks up on the back side of the leather. Once there is enough on the back side, it will eventually seep to the front and form little dark spots like in this photo. Use a soft cleaner made specifically for leather. Of course, we sell them and you can purchase one from any franchisee. (Forgive the shameless plug!) 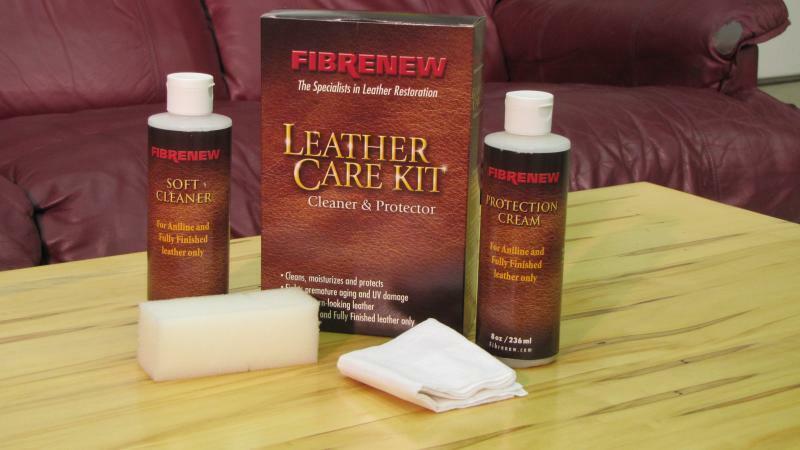 You can also get other leather cleaners at most furniture retailers. Squeeze a little cleaner onto a clean sponge and use a circular motion to clean dirt and oils off your couch. Then, use a cotton towel to dry it off. Use the same circular motion and a soft cotton cloth to protect your couch. What if my couch is already damaged by oil? If you are already seeing the effects of oil damage, usually in the form of dark spots like in the photo to the left, you can try to work on it yourself with a soft leather cleaner. If you’re not seeing the results you want or if the spots are coming back quickly, the oil may have permeated deeper into the leather than you can clean yourself, and you need to call a professional. Additional questions? Leave them in the comments!